Dentures are wonderful tools that help many people to live a normal life, even after they have lost their natural teeth due to disease or injury. However, when you first get your dentures, there will be a period of adjustment for you. One thing that you may struggle with is getting your dentures to remain in the proper place in your mouth. The first thing you want to consider is whether your dentures are properly created to fit your gum tissue. 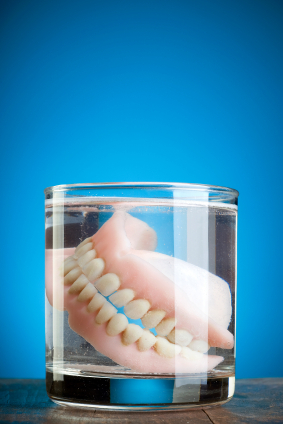 When we fashioned dentures for you, we will make them as an exact match for your gum tissue. When you put them in, they should fit up against each and every you RE age and come to work in your gum. If they do not, this can be one cause of dentures that do not remain in place. If you have had your dentures for some time already, and you find that they no longer fit properly, it may be due to a change in the shape of your gum tissue. This can be a result of bone loss from the underlying bone tissue. If your dentures do fit correctly, and you have not suffered any bone loss, then you can usually take care of the problem by using denture adhesive. Denture adhesive is exactly what it sounds like: a mild adhesive paste that helps to hold your dentures in place in your mouth. Denture adhesive can come in the form of a powder that you spread it around the dentures, or it may come as a paste very similar in consistency to a thick toothpaste. Both types of denture adhesive seem to work fairly well, so the type that you use will be largely a matter of personal preference. Please contact us if you have any questions about your dentures.